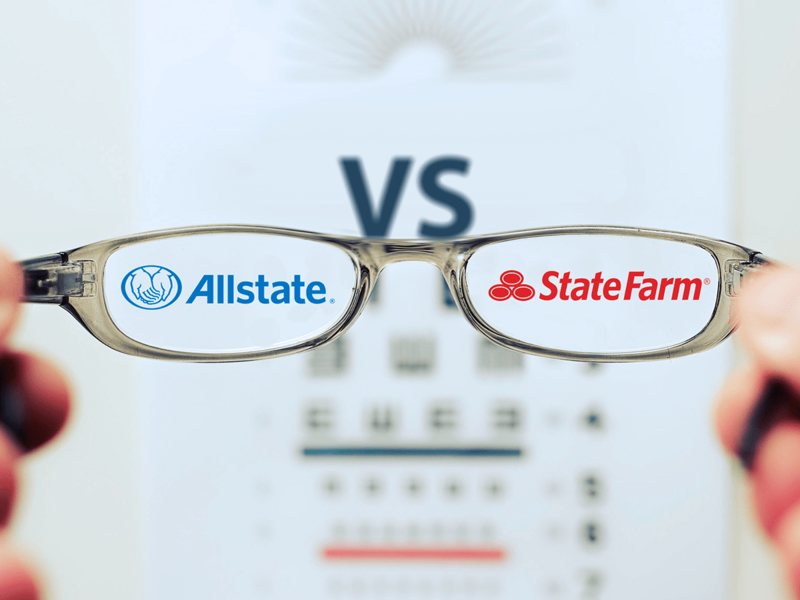 Why Compare Allstate Vs. State Farm Insurance? When you want to find out about the best car insurance companies, you probably want to check out the differences between Allstate and State Farm because they are some of the best car insurance companies around! When you use a comparison shopping engine for insurance like this one, the chances are that these two giant insurance companies are going to be among the results. They both offer insurance in most areas in the US so they are ones you will want to know about. State Farm is the largest, offering the most car insurance policies in the US and Allstate is one of the largest as well. They are both great options for coverage, with a few differences. Allstate was founded in 1931. In the beginning it was actually part of Sears Roebuck Co. which is the same company as the famous department stores. The company was a spin off of Sears’ popular Allstate Tires, which were named in a contest! Just as the Sears catalog revolutionized shopping by bringing the availability of products to people who were not within close distance to a store, the people who created Allstate Insurance wanted to do the same thing for the insurance industry. So, they created car insurance by mail! At first it was sold through the Sears Catalog, but eventually it was sold anywhere and everywhere. In 1993 Allstate split off into its own company and now you can buy policies from an in-person agent, online and over the phone. The company’s famous slogan which has changed a bit throughout the years has always had something about being in good hands in it. The first version appeared around 1950 in the company's first television advertising campaign. It was “You’re in good hands with Allstate.” In 2004 they started using “Are you in good hands?” which is a play on the original idea. Most people recognize the iconic logo which is two outstretched hands, and the catchy commercials with a narrator who has a strong voice letting people know they are safe. They also have a funny character named Mayhem who shows people why they need to have Allstate Insurance! When searching for car insurance through Allstate you will be very happy to know that there are several discounts that you can get on your car insurance. Many of them are similar to other car insurance companies but some of them are unique to Allstate only so you will want to pay attention to this section very much! If you’re the first owner of your car, you could save pretty big - up to 15% - on car insurance. Other discounts related to the vehicle include a discount of up to 10% for anti-lock brakes and anti-theft devices. If you sign up for automatic withdrawal you will see an additional 5% off of your car insurance premiums. Those who get an ePolicy - one that is all online can save 10%, and if you always pay on time for a year you will also get 5% off. If you sign up for car insurance at least 7 days before you will need it you can save up to 10%. You can also save that amount if you pay your policy in one go instead of monthly. Students who meet certain criteria can save up to 35% and safe drivers can also save depending on various criteria. Allstate also offers accident forgiveness which means if you get in one accident your car insurance rates will not go up, but if you are a serial offender, you can’t count on that luck more than once. State Farm is often considered the largest car insurance company because there are over 80,000,000 people who have insurance policies with them and over 40,000,000 of those are car insurance policies. State Farm was founded in 1922. As the name would suggest they first focused on insurance for farmers, but later on they decided to focus on the general public. Now they not only offer car insurance but also home and life insurance as well as some other services. State farm is well known for its tri-oval logo and their slogan that “like a good neighbor State Farm is there.” They pride themselves on offering customer service as if they were really your neighbor. State Farm is well known for their many car insurance discounts that you should definitely take advantage of if you decide to go with them for coverage. They do have a tool that you can use to make sure that you are definitely getting all the discounts that you are supposed to have so make sure to use it! Many of the State Farm discounts have to do with your own driving record. These include discounts of up to 25% for doing things like take a defensive driving course, being a good driver for 3 years or more, or being a student whose car is housed away from where they attend school. Plus, drivers who take specific courses whether it is a defensive driving course for experienced drivers or a class for new drivers, can save. Other discounts come for having a safer vehicle. This means that you may have some anti-theft devices installed but you could also get discounts for features which are found on most modern cars like anti-lock brakes and airbags. Finally, if you have different types of insurance plans, all with Allstate, you could save big. When you have multiple cars insured with the company you can also get a similar discount. So now you can see why it would be a good idea to compare these two insurance companies. Use General Insurance to get access to quotes from either of these companies and then find out which one would be the cheapest in your area and make a choice. Either one would be solid. They are both great choices for car coverage, it just depends on your specific situation and needs!